The JEE Advanced exam is considered as one of the most important examination in the country .JEE Advanced 2018 Exam will be conducted by IIT Kanpur on 20th May 2018. 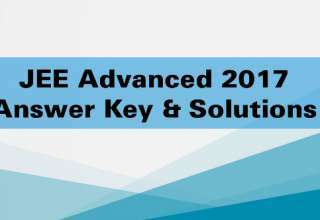 To get admission in top Engineering colleges, students have to clear JEE Advanced 2018 and for that JEE Advanced Answer Key 2018 acts as an important information for the students after they give the exam. The answer key of JEE Advanced has correct answers to all the questions asked in the entrance examination. JEE Advanced 2018 Video Solutions and analysis will also be available for the students. Students will be able to know their JEE Advanced score with the help of MOTION’s Answer Key and Video Solutions. Motion also provides guaranteed and authentic Video Solution of JEE Advanced which will be available after the exam on the website (idioms website) of MOTION EDUCATION PVT LTD. Paper analysis of the whole paper subject wise will be made available to the students to help them understand the paper pattern, difficulty level and expected cutoff. The JEE Advanced 2018 Rank Predictor tool helps students to predict their JEE Advanced 2018 rank before the result is declared by CBSE. After checking their correct answers they will have to enter their marks in a form below to check their rank. This helps the students to get their rank much before the JEE Advanced 2018 result declaration. For all those anxious students who want to know which branch they most likely will get, MOTION has designed JEE Advanced 2018 Branch Predictor Tool; it is very helpful for JEE aspirants to know about expected college and branch. MOTION will provide the answer key for both Paper 1 and 2 of JEE Advanced 2018. Students have to follow the marking scheme as defined by CBSE to calculate the probable score. Post calculation of scores students to have access of Rank predictor, College predictor, Branch predictor, after calculating the score, candidates can use the rank predictor of JEE Advanced 2018 to predict their rank. In case a student finds any problem with the official answer sheet they should follow the following instructions to challenge the official answer key. Enter their login credentials on official JEE Advanced website. Rs 500/- is the charge to challenge each question in the official JEE Advanced 2018 answer key. Final decision will be of the experts, the exam conductors. JEE Advanced official website will declare the result in June 2018. All India Ranks and Category-wise All India Ranks will be published online. Text messages will also be sent out to the registered numbers of candidates as soon as the results are declared. This is the only way the results will be declared. No individual mails will be sent out to candidates. The cutoff is the minimum prescribed marks that candidates need to secure in each subject and in aggregate. JEE Advanced 2018 rank list will contain the names of all those students who have got minimum aggregate needed for the cut off. The Joint Seat Allocation Authority (JoSAA) which is organized through online mode is for the qualified candidates. This includes Online Registration, Choice Filling, Choice Locking, Seat Allotment Letter, Seat Acceptance & Reporting to the allotted college. Authorities organize six levels of seat allotment in various colleges which come under JoSAA. Post seat allotment the verification process is done where the candidates need to being their documents along with photocopies. Next article Want to study Medicine after class 10th? Are you fit to become a Doctor?